Constant travel for work and a busy life on the road comes with a lot of nights in hotels. I have spent 24 of the last 30 nights in a hotel, and it’s looking like there are only 2 nights at home in my near future before I’m back at it again. So with all this time spent in hotels, I’ve come up with quite a few tips and tricks within the hotel room to make your stay a little more comfortable. So simple I almost feel a little silly sharing, but I had never thought of these until recently. Trick #1: The Styrofoam Toothbrush Holder: It all started with my disgust at putting my toothbrush down on an unfamiliar, untrustworthy counter. I know these places are cleaned more often than my own bathroom counter at home, but I still couldn’t do it. I created myself a toothbrush holder. Take the plastic or styrofoam cups they give you for water or coffee, turn upside-down and stick your toothbrush through the bottom. Much better than just in a cup; with only one toothbrush it’ll fall over onto that dirty counter anyways. Trick #2: The Homemade Exfoliator: You’re away for a long time, you tend to forget a few items. This includes toiletries. I know they give you little bottles of this and that, but they’re never any good. I also mean the extra things. I don’t always anticipate scaly legs and dry arms while packing. So make your own exfoliator. Take that little bottle of conditioner, and mix in the little packets of sugar at the coffee station. Voila, homemade exfoliator. Trick #3: The Pillow Plumper: There is nothing worse than missing a good nights sleep because of a pillow. This can be fixed! Too lumpy or soft? Take the pillow case off the pillow and stuff it with towels. Firm, flat pillow. Have the opposite problem of the pillow not being plump enough? Add towels to the pillow case to plump it up! Trick #4: The Wet Swimsuit: Time to pack but your swimsuit is still wet? If only you had a plastic bag! Well, check that ice bucket. You never used it anyways. Hotel room ice buckets are always lined with a plastic bag. Pop in your wet swimsuit and there you have it, a safe-to-pack suit that won’t get everything else in your bag wet! The long days on the road sure do teach me a lot. 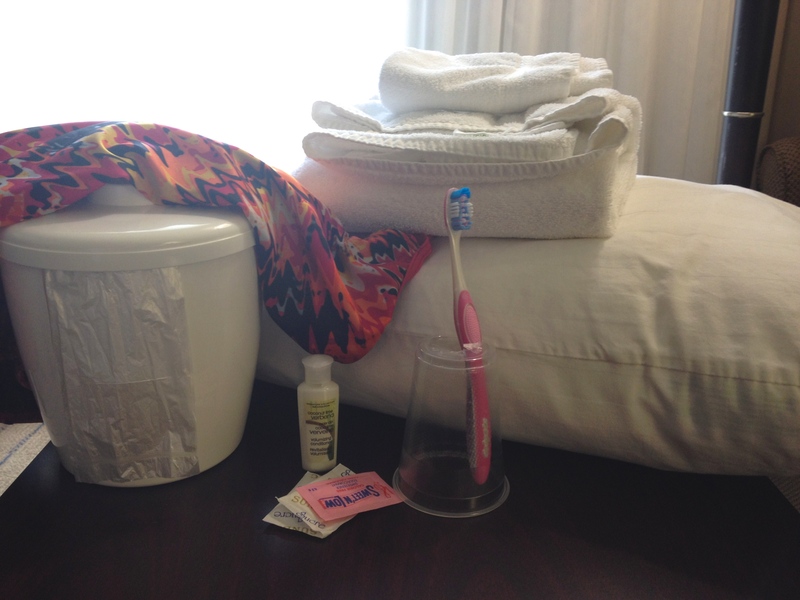 And although these little Hotel Room Hacks are not major life lessons, they sure do make life a lot easier! Now excuse me while I flatiron myself a grilled cheese sandwich! (Kidding!! But possible. Cheese sandwich + tinfoil + iron = desperate but yum!) Have you ever discovered any Hotel Room Hacks?